Cats and water are not two elements that normally combine well. With only a few certain breeds and individuals that are an exception to the rule, most cats will balk at the first sign of an impending bath. 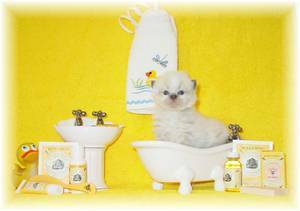 However, bathing is an important routine that you should get your cat acquainted with as young as possible. By following just a few simple steps, you can make the whole experience relatively easy and enjoyable for you and your pet. Bathing your cat with a medicated shampoo may be necessary if your pet has dry, flaky skin. While most wild outdoor cats shed only twice per year, indoor cats shed constantly due to regular self-grooming. Bathing your pet removes extra hair that could result in hairballs. Your curious cat might have gotten a substance on his or her fur that you don’t want them to ingest, such as potting soil that may contain dangerous pesticides, cleaning fluid, or even motor oil. Bathing combats allergies. When your cat grooms itself, saliva dries on the fur, flakes away, and becomes a sneeze- and itch-causing allergen. If you have a tendency to sneeze when the fur flies, bathing your pet regularly can help reduce those symptoms. You’ll first need to decide where to bathe your cat. A bathtub may seem big and intimidating to your feline, so it’s best to use a kitchen or bathroom sink. Make sure to put a folded towel on the bottom so that your cat will have something to make him/her feel stable. You’ll also need a cup for rinsing your cat, a small sponge for bathing his or her face, pet shampoo, and a couple of towels for drying your kitty. If you’re tense before you begin the bathing process, you can bet your cat will be too. Fear of the unknown is what makes bathing so difficult for pets, so with patience, a laid-back attitude, and repetition, you will be able to ease your cat into the joys of the bathtub. Again, however, a good bathing routine is best begun young as older pets have a harder time adjusting to new routines. Preparation will take up the most time when bathing your cat. There are actually only a few steps involved in the actual bathing process. Begin by filling up the sink that you plan to use with warm tap water and with just a little shampoo added for a nice bubbling effect. Bathe your pet in water set to a suitable temperature for infants. Moving slowly and calmly, scoop your pet up and settle him or her in the bath. Once again, the towel will provide traction. Make sure to keep a firm and steady grip on your pet’s scruff at all times. You don’t want to chase a wet and frightened cat around your house. Dampen the small sponge and gently wash around your cat’s face and ears. It’s best to do this step while the water is still clean, since no one likes to get soap in their eyes, and cats are no exception. Using the a cup, pour water over your cat’s back and sides, making sure that your pet’s fur is completely wet. Don’t wet your cat’s ears or face: that’s what the sponge is for and water in your pet’s eyes and ears will stress them out unnecessarily. Take a small amount of shampoo and lather your cat’s fur. This might be difficult to do one-handed, but you’ll still want to keep a firm hand on your pet to ensure that they don’t escape. Rinse with the cup two or three times, making sure that all suds are washed out of your cat’s fur. Lift your cat from the sink and set him or her on one of the two towels that you have ready (a counter top or table is best for this, so you don’t strain your back). Run your hands over your cat’s fur, gently squeezing out as much excess water as possible. Then, using soothing circular motions, rub the towel into your pet’s fur until it begins to dry and fluff out a bit. If your pet has long hair, a blow dryer may be necessary to make sure your pet doesn’t run around with wet fur for several hours afterward. Make sure that your blow dryer is set on low heat, for both noise concerns and to prevent burns on your pet’s sensitive skin. If your kitty seems overly afraid try towel drying as much as possible and keep him or her in a warm room until mostly dry. 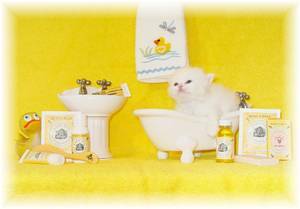 Our favorite part of bath time is finishing with a nice pet bath mist to help with keeping your kitty's coat soft and free from tangling. We use a kiwi-mango scented spray from Life's Abundance that is just wonderful! Bathing your cat once a month is an important part of the grooming process. A good bath will cut down on hairballs and can also lessen allergy symptoms displayed by you or your family members. Use a firm and gentle touch, as well as plenty of patience, and both you and your pet will soon come to enjoy the routine. Now that your kitten is fresh and clean, he or she may require some grooming. Learn some helpful grooming tips by visiting our Cat Grooming Article!